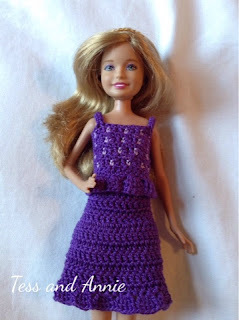 Here is a fairly simple outfit pattern for a Stacie doll. Enjoy! Row 1: Ch 33, dc in 4th st from hook, 1 dc in each ch across, turn. Rows 2-4: Ch 3, 1 dc in each st across, turn. Join to 1st st at end of row 4. Rnd 5: Repeat row 2, joining at end of rnd, turn. Rnd 6: Ch 3, (2 dc in next st, 1 dc in each of the next 2 sts) around, join, turn. Rnds 7-12: Repeat row 2. Rnd 13: Ch 4, 4 tr in same st as ch, (skip 2 sts, 5 tr in next st) around, join. Fasten off. Weave in all ends. Row 1: With dark purple, ch 32, dc in 4th st from hook, 1 dc in each ch across, turn. Row 2: Ch 3, (1 dc in each of the next 2 sts, join on lavender, sc in next st, pick up dark purple) across, turn. Row 3: Ch 1, (sc in dc sts, and dc in sc sts) across, turn. Row 4: Ch 3, dc in next st, (join on lavender, sc in next st, pick up dark purple, 1 dc in each of the next 2sts) across, turn. Row 9: Ch 1, 1 sc in each of the next 9 sts, ch 10, sl st in the 5th sc of the row, turn, ch 2, 1 hdc in each ch across, (back to the normal row) 1 sc in each of the next 9 sts, ch 10, sl st in the 5th sc of the row, turn, ch 2, 1 hdc in each ch across, (back to the normal row) 1 sc in each of the next 9 sts. Now, turn and crochet down the side of the top. When you reach the bottom edge, ch 4, (working into ch loops), (5 tr in next loop, skip 2 loops) across bottom. When you reach the end, ch 1, sc down side of tr, sc evenly up side of the top. Join to the 1st st of the row, fasten off.